The fascinating history of Ridge Wood contained in these pages should be useful to teachers of Key stage 2 and 3 or others requiring simple background information. Ridge Wood - as its name implies - is a tree-covered wedge of high ground that marks the boundary between Yate and Chipping Sodbury. Part of this woodland is believed to be ancient, but in past times, much of this landscape is likely to have been far more open. It is just possible that this 'little wood' may refer to woodland growing on the Ridge. 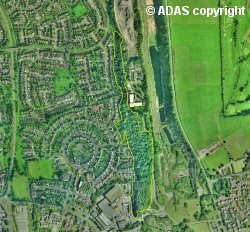 Woods associated with parish boundaries do tend to be very old - it is reasoned that they must have existed during the era when the parish system was being established and were therefore chosen as boundary markers because they were so conspicuous. However, it could be that the Ridge was adopted as the border between the Sodburys and Yate because its height made it an easily-recognised part of the landscape. 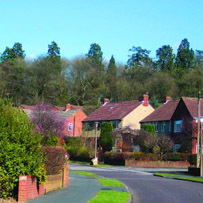 Today, despite the modern skyline of shops and houses, Ridge Wood is still a dominant landscape feature. Viewed from Yate Shopping Centre, it presents itself as a long, wooded prominence containing tree species native to Britain, as well as huge, exotic parkland specimens. Rising above the greenery, are the giant, coniferous Sequoiadendron giganteum (Wellingtonia) trees that were established there during the 19th century. The wood contains many intriguing features. Outcrops of the underlying limestone seem to have an ornamental significance and there is other stonework that seems to preserve clues indicating a landscape that has been long since lost. In spring, there is an abundance of woodland flowers, but not all of these have colonised the area by their nature's own efforts. The history of the Ridge lies hidden now, but the hints that remain lead us to explore more deeply so that we can discover what dwelt here in the past.